It’s Diwali time and I’m sure you all must have started making namkeens at home, it’s like a tradition for us and we all follow it with joy. 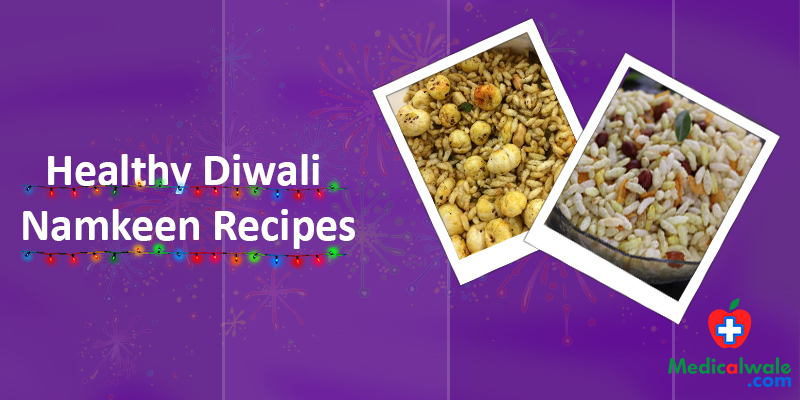 Most of us have a fixed set of recipes that we make every year but how about this year we keep it healthy yet yummy? Our dietitian Miss Belly has made these special recipes just for you. So let’s get healthy this Diwali. Step 1:- Combine all the above ingredients in a large bowl, and knead the soft dough, add little water to make the dough soft. Put the mixture into chakli maker and make medium-sized round chaklis. Step 2:- Arrange these chaklis on to a greased baking tray. Bake the chaklis in a preheated oven at 180-degree c for 20 minutes. Step 3:- Check and rotate each chakli after 10 minutes. Remove from the oven. Enjoy oil free crispy Chakli! Step 1:- Dry roast the poha in a large pan for 5 minutes, keep stirring continuously otherwise peanuts will shrink. Heat the pan on high flame. Add oil in a large vessel, once oil is hot turn gas on medium flame and adds cumin-mustard seeds, let the mustard seeds splutter, add green chillies, peanuts and cashew nuts fry it for 2 minutes until cashew nuts become golden brown. Step 2:- Add chana dal, curry leaves, garlic paste, dry coconut slices and sesame stirs the mixture for another 1-minute coconut slices starts turning golden brown. Now turn off the flame and add turmeric and salt. Step 3:- It will burn if the flame is on stir well. Pour this mixture on roasted poha. Mix well with hands. Lastly sprinkle cumin powder, amchur powder, sugar powder and raisins. Mix thoroughly until masala and poha mix well. Keep it open till it cools down, store it in an airtight container. • 2 tsp extra virgin olive oil or coconut oil. 1. Dry roast oats until slightly golden. Set them aside to a plate. 2. Next roast poha in the same pan. Keep stirring and fry until crisp and light. Set them aside. 3. Heat oil and crackle mustard, cumin and red chilli. Roast peanut until golden. 4. Add garlic, green chilli and curry leaves. 5. When the garlic begins to smell good, add coconut and fried gram. 6. Fry until the coconut smells good. 7. Add turmeric, chilli powder and salt. Switch off the stove. 8. Transfer poha and oats. Mix everything well. 9. When the mixture cools down, add more salt if needed and pour little coconut or olive oil. Toss them. 10. Store oats chivda in an air tight jar and use within 2 weeks. Healthy Diwali wishes to everyone.